Difference between revisions of "Pang Mipham Gönpo"
'''Pang Mipham Gönpo''' ([[Wyl.]] ''spang mi pham mgon po'') was a student of [[Vairotsana]]. He was already eighty years old when he met his famous teacher but by practising diligently with the aid of a 'meditation support' he gained realization and ultimately attained the [[rainbow body]]. 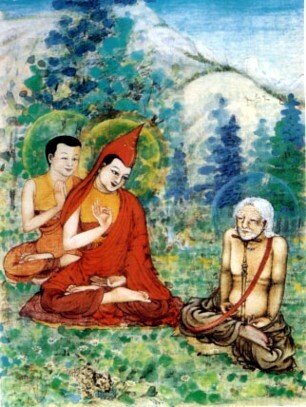 '''Pang Mipham Gönpo''' (Tib. སྤང་མི་ཕམ་མགོན་པོ་, [[Wyl.]] ''spang mi pham mgon po'') was a student of [[Vairotsana]]. He was already eighty years old when he met his famous teacher but by practising diligently with the aid of a 'meditation support' he gained realization and ultimately attained the [[rainbow body]].